Spiders, mites, ticks, and scorpions make up the class Arachnida. Arachnids are members of the phylum Arthropoda, which also includes crustaceans (such as crabs and shrimp), insects, and other animals with an exoskeleton and jointed legs. Although arachnids vary in form and behavior, they share certain characteristics. All arachnids have two body segments, eight legs, and no antennae or wings. Unlike many insects, arachnids do not go through metamorphosis but hatch from eggs as miniature adults. Most arachnids are carnivores, often delivering digestive enzymes to their victims externally (by squirting it onto or injecting it into the dead or paralyzed prey), and then sucking in the liquefied food. Most arachnids have poor vision and rely mostly on sensing chemicals and vibrations. The jumping spiders, an exception, have excellent vision. The most common arachnids are mites (order Acari) and spiders (order Araneae). Although mites outdo spiders in sheer numbers, and likely also in numbers of species, mites are all very small (often microscopic) and hard to observe. 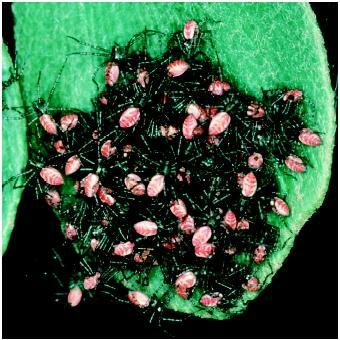 They usually parasitize plants or animals, and are very abundant in most terrestrial environments. Spiders, although less widely distributed, are found on all continents except Antarctica, and in almost all habitats except the ocean. (Sea spiders are neither true spiders nor arachnids.) Because of their greater physical size, spiders have been studied more, and have played more of a role in human society throughout history. Newly hatched green lynx spiders. The most interesting, distinctive, and useful adaptation of the spiders is their silk. Spiders secrete silk (a kind of protein ) using organs on their abdomens called spinnerets. Spiders put the silk to a multitude of uses: building webs, covering egg sacs, lining their burrows, constructing safety tethers, even making "parachutes" for the dispersal of young spiders on a windy day. Some jumping spiders have even been observed attaching a thread to a wall like a bungee cord and then jumping into the air to catch an insect in flight. Levi, Herbert W., and Lorna R. Levi. Spiders and Their Kin. New York: St. Martin's Press, 2001. Mason, Adrienne. The World of the Spider. San Francisco: Sierra Club Books, 1999.